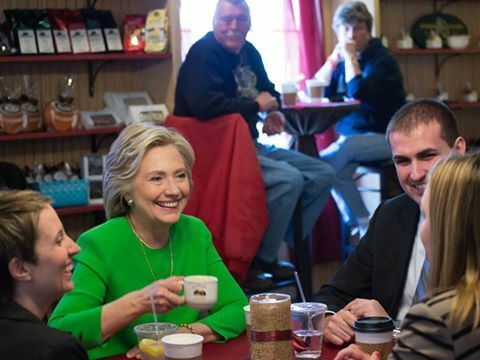 On day two of her journey, Mrs Clinton left her New York home in a mini-van for Iowa and, a few hours into the 1600km trip, the 67-year-old Democrat tweeted a picture of a friendly family at a Pennsylvania petrol station (photo above). 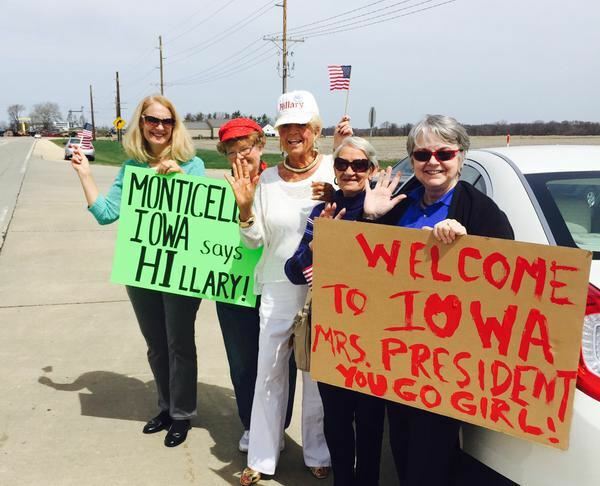 On day three, she arrived in the important primary state of Iowa where she was greeted by some fellow travellers, if you’ll excuse the pun (photo tweeted below). She doesn’t appear in the 2-minute video until 1.33, letting those ordinary and real Americans, not actors, talk about their aspirations for the future. And there is no Bill Clinton in sight. Tell me that the Republicans won’t use that against Hillary in the campaign if she wins the Democratic nomination, and I will have to beg to differ with you. They will use that as well as Mrs Clinton’s denial of the allegations of her husband’s affair with Lewinsky the day after he publicly denied it. It’s all there in the report by the independent counsel, Kenneth Starr, which led to the President’s impeachment by the House of Representatives on charges of perjury and obstruction of justice. He was acquitted on both charges by the Senate in 1999. The Republicans are already bagging Hillary Clinton’s use of a personal rather than a government email account while she was Secretary of State, donations from foreign governments, including Australia, to the Clinton Foundation from which she resigned yesterday, links to the recent Iran nuclear agreement, and the terrorist attacks in Benghazi, Libya that led to the death of ambassador Chris Steven and three other Americans when she was secretary. I’m sure there will be more in the months to come. I wrote at the time: “Julia Gillard is warm, charismatic, funny and engaging, and that doesn’t come across on television very often, but when you see her working a room as she did with our studio crew and observers last Sunday morning, you’d think she was a female Bob Hawke – and he is the best I’ve ever seen. Let Julia Gillard be Julia Gillard and the Labor Party and the country will be a better place as a result.” I haven’t been up close and personal with Hillary Clinton, but I’m betting she would be “warm, charismatic, funny and engaging,” if Team Clinton allows her to be so. UPDATE: A friend of mine, Ron Javers, a former executive editor of Newsweek, recalls a lunch with editors (including then editor-in-chief of Esquire, Terry McDonell) and publishers convened by Ellen Levine, then editor-in-chief of Good Housekeeping Magazine and a rising star at Hearst, who’s now editorial director of Hearst Magazines. Ron writes: “After being introduced by Ellen, Hillary rose from her chair and, as she spoke, began moving around the room, speaking without notes, on a wide variety of political and national issues. She was quite knowledgeable and compelling, yet informal, witty and warm. She was not terribly well known in those early days of Bill’s candidacy for President, but it is safe to say she charmed that room of hard-boiled, high-powered New York publishing executives and editors. Some of them would be surprised that a few terms later, they would be voting for her as Senator Clinton of New York.” This augurs well for the Team Clinton’s Likeable Campaign. But the Republicans will do everything they can to portray Hillary Clinton as tough, mean-spirited, arrogant and a key member of an administration that has failed middle-class Americans. Barack Obama has said she will make an excellent president, but it’s unlikely she will be doing much campaigning with him, except in African-American constituencies. And if former Florida governor Jeb Bush manages to overcome his baggage as a member of a controversial family including two former presidents, then it’s possible a Bush and a Clinton will be the main combatants in the 2016 presidential election campaign — déjà vu all over again. It will be a long and winding road to the White House, with much mud thrown along the way.